1. 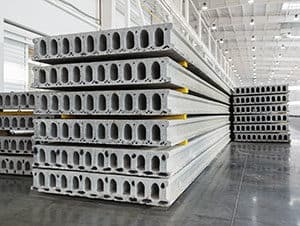 Precast concrete is produced in a factory with advanced construction techniques. 2. The materials used in precast concrete production are easily obtainable. 3. The construction procedure is very fast, which ultimately saves time. 4. It possesses better thermal insulating characteristics. 5. Precast members are totally fire-proof and sound-proof. 6. Precast members are lightweight and can be transported easily to the job site. 7. Formwork is not required in such construction. 8. If necessary, precast members can be separated and reused in other structure. 1. It requires careful supervision and more skilled workers for producing the members. 2. Uniform spacing between beams are required in the structure, which can become difficult. 3. Some members are broken up and wasted during the time of transportation from the factory to the construction site. 4. The molds that are used for casting are little costly, so the construction will be economical when a lot of members are produced. ALSO READ – ADVANTAGES AND DISADVANTAGES OF PRESTRESSED CONCRETE.